We were all stoked to wake on day 1 of this charter to an absolutely beautiful day on the water. 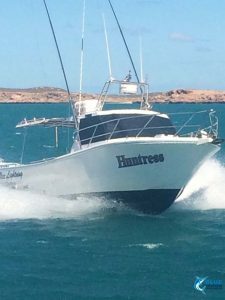 As we departed Dampier bound for the Montebello Islands the crew were all excited at the possibilities of Monties fishing. They didn’t have to wait long for the firsts to start with Mitch landing his very first Rankin Cod on the way out to the islands. 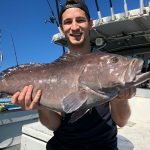 The crew had plenty of fun with some bottom fishing and trolling on the way to the islands keeping the crew happy and warming them up for things to come. Day two started with Robbie breaking the boat record that no one wants to break…. Being sick! Lucky for him the day could only get better and it did with the crew catching sight of an incredible Dugong. 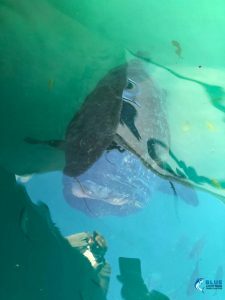 It was Mitch though who had his day made as a Sailfish followed his jig, the excitement on board built quickly, before he unfortunately lost it. Meanwhile Wes was fighting to get a fish past a shark, you couldn’t make this stuff up, it’s these incredible events that make the Monties so special. The fish had an easy release in the end which meant the jig came flying back hitting Wes on his hat! It was a very close call and had us all holding our breath for just a moment. But the amazing Montebello Islands moments just kept on rolling with the crew witnessing a Whale coming very close to the boat when we were stopped, what a way to be welcomed to the Monties ? At the end of day 2 the crew had caught a good bunch of species including favourites Rankin Cod, Red Emperor and Coral Trout with some seriously impressive stories to tell. For day 3 the crew decided to head out on Heartstarter for some fishing in close to the Montebello Islands. 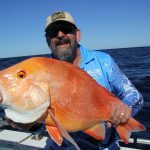 Robbie had a much luckier day catching 2 Coral Trout on one SkipJack lure to really light up the smile on his face. The highlight of the day though was Jules getting inked, with a squid getting him right in the face (see the photo my description doesn’t do this one justice hehe). Wes scored himself a Shark Mackerel, while the rest of the crew caught plenty of Squid. 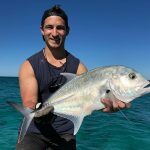 A Golden Trevally was Andrew’s catch of the day, but Mitch was stoked to score himself a small GT after working hard at the fight. Wes had a big Spangled Emperor on the line with a sinking stick bait, but it wasn’t to be with it snapping and being donated to the big blue! It was time for the crew to stop for a bite to eat before heading back out for an afternoon aboard Huntress. The crew had a ball on Huntress, exploring in close to the islands and seeing historical sights and all the reasons we think these islands are just so special. The water was calling their name so the boys had a good little snorkel but unfortunately didn’t manage to bag themselves any Crayfish to finish off the day. We kicked off day 4 with some bottom fishing. 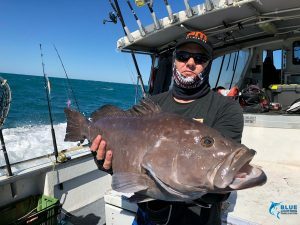 The crew caught a seriously impressive mixed bag of Montebello Islands species including Chinaman, Rankin Cod, Crimson Sea Perch, Long Nose Emperor, Coronation Trout, Coral Trout and Red Emperor. This crew is filled with keen billfisherman, and as you know you don’t have to ask Captain Chad twice to chase a billfish. The day started off a little slow so Captain Chad suggested the crew switch to stick baits. 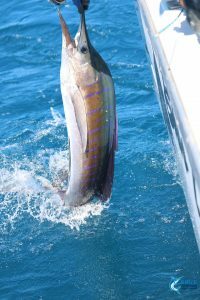 Within two minutes there were quite a few Sailfish off the back of the boat. Before we knew it we had a three way hook up on our hands. Guy, Mitch and Wes landed a Sailfish each with both Mitch and Wes ticking Sailfish off their fishing bucket lists for the first time! It was time for the hard body lures to get a workout. 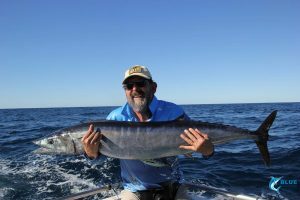 We didn’t have to wait long before Jim’s day was made after he landed his largest ever fish, his first Wahoo all in one go. Next up we had another 3 way hook up, this time on Wahoo with Cam, Mitch & Guy all landing one each. This was shaping up to be an epic day, you know the kind that you tell all your mates about. 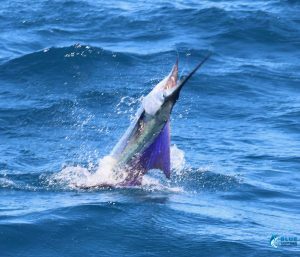 After a few more Wahoo were caught a Sailfish came for a look and the switchbaits were in and we had yet another three way hook up on our hands with Cam, Robbie and Guy all scoring Sailfish. 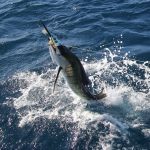 The Wahoo were next on the hook with crew reeling in a couple more impressive Wahoo before Jim and Wes topped off the day with another Sailfish each. This brought our total for the day to 8 Sailfish!! The whole crew and Captain Chad could hardly contain their excitement with plenty of cheering and congratulations filling the deck. With a list of highlights like this I could understand you thinking this was for a whole week but no, the Monties are just that special, this was ONE day!!!! After such an exciting and exhilarating day 4 the crew were ready for a little break on day 5. We started the day with a bottom fishing session which was very quiet. 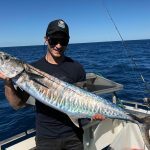 It was time to try our hand at trolling and boy did things change, we had an awesome session on Mackerel, with the whole crew stoked to catch plenty of nice fish. 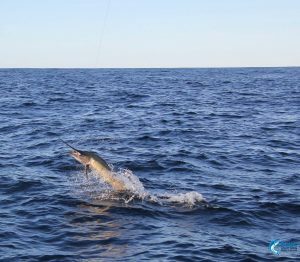 Next up was a bottom fishing session, or so we thought…it quickly turned into a Sailfish session after a pack of Sailfish surrounded the boat! All hell broke loose, the excitement was beyond electric, Captain Chad was in his element and the crew were almost beside themselves. 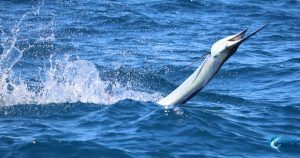 In the next two and a half hours we had absolute chaos on the deck with the crew catching and releasing… 21 Sailfish!!! What a week at the Montebello Islands!!! On top of all this Guy scored himself a personal best Chinaman and caught a Sailfish on a jig. For day 6 the crew decided to spend the morning aboard Blue Lightning. 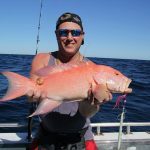 It was a fun day fishing offshore where the crew managed catch plenty of Queenfish. Day 7 was upon us but before the crew could be disappointed in having to go home the weather turned, meaning we spent an extra night at the islands. 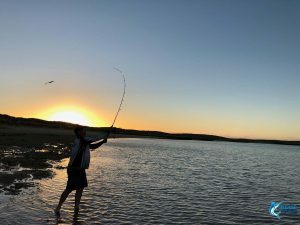 To make the most of the extra time the crew spent time exploring the nuclear weapons testing site and of course fishing. With the crew catching Spangled Emperor and Squid to make for a fun extra day of fishing at the incredible Montebello Islands. 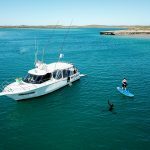 As day 8 dawned the weather calmed enough for us to make the trip back to Geraldton.